Heat the oven to 375°F. Spray 12 (3-inch) muffin-pan cups with vegetable cooking spray. Press the bread slices into the bottom and up the sides of the muffin-pan cups. Spray the bread cups with the cooking spray. Bake for 10 minutes or until the bread cups are lightly browned. Remove the pan from the oven. Reduce the oven temperature to 350°F. Stir 1/2 cup cheese, the egg substitute, spinach, artichoke hearts, bell pepper, basil, garlic powder and ground red pepper in a medium bowl. Spoon the mixture into the bread cups. Bake for 20 minutes or until the filling is set. Sprinkle with the remaining cheese. Serve immediately. Tip: You can substitute Pepperidge Farm® Light Style 7 Grain, Oatmeal or Soft Wheat Bread for the Extra Fiber Bread. 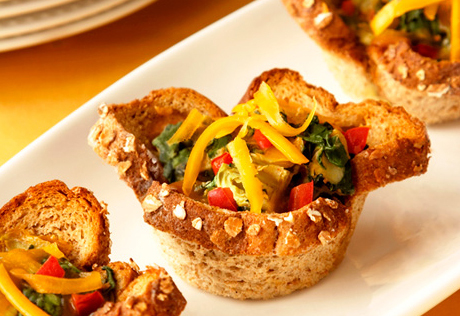 Make-Ahead Tips: You can make the bread cups up to 8 hours ahead. Store covered at room temperature and reheat at 350°F. for 5 minutes before filling with the vegetable mixture as directed above. You can also refrigerate the finished veggie cups, covered, for up to 1 day. To reheat, uncover and let the veggie cups stand at room temperature for 10 minutes. Bake at 375°F. for 10 minutes or until hot.